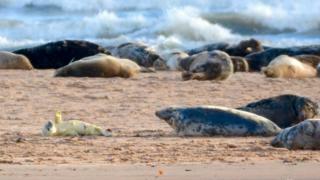 The first pup of the season has been born on the Ythan Estuary on Forvie National Nature Reserve. The site at Newburgh is a popular spot for people to watch seals. Keen photographer Ron Macdonald captured a shot of the seal on its back, and described its waving pose as a "hello world" moment. Scottish Natural Heritage (SNH) said: "It's great news. But please don't get too close for the animal's and your own safety."